Hearing the television when you have a hearing loss can be challenging. How many times has your significant other complained that the neighbors can hear what you are watching? How many times do you fight over the volume control? We can put an end to these problems using wireless connectivity in modern hearing aids. We have a plethora of hearing aid accessories, all designed to fit your needs. These hearing aids can connect to your cell phone, television, and home phone line using specialized adapters. This means you can hear people on the phone and TV better than ever before without bothering the neighbors. Metro Hearing offers a full range of these devices for every need and the expertise to set it all up. Now Opn wearers have a wider choice of smartphones they can use to make and receive clear, safe, hands-free calls. 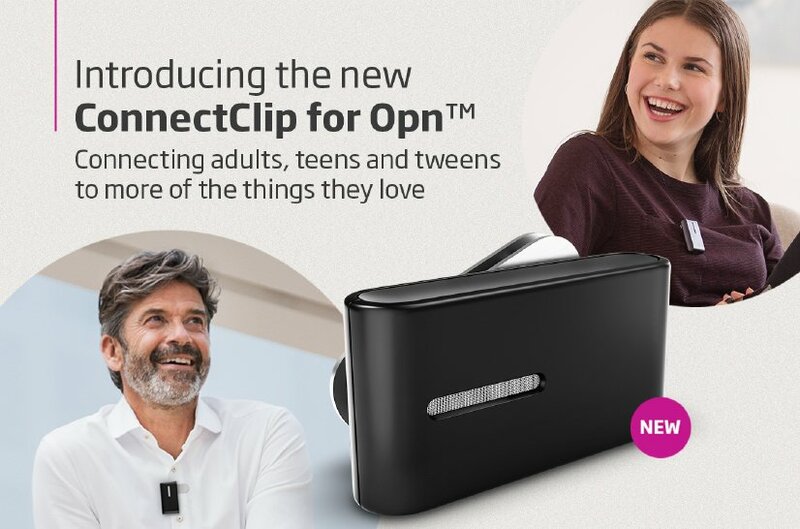 Whether they prefer iPhone(R) or Android (TM), the new ConnectClip will enhance their experience! What Opn wearer wouldn’t be thrilled to listen to their favorite music streamed directly to their hearing aids in rich, stereo sound? 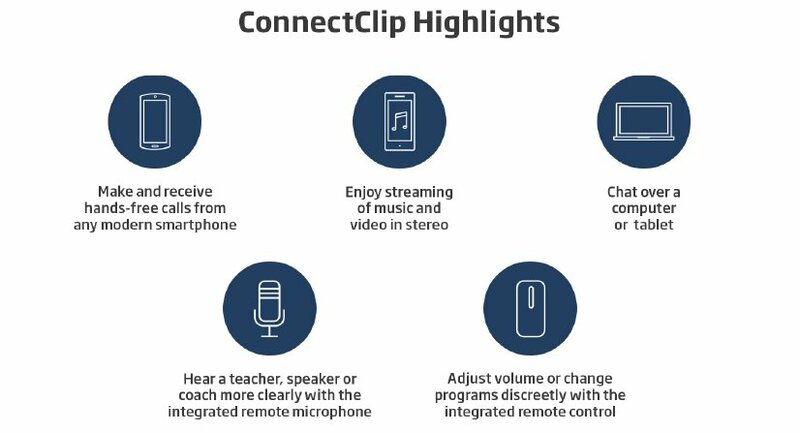 Additionally, ConnectClip’s remote microphone functionality enhances the benefits of Opn for teens in noisy classrooms. ConnectClip opens up more advanced connectivity options for a wider range of patients of all ages. For those whose hearing loss may be less severe, MetroHearing also offers hearing aid accessories that can give you that extra boost in sound to enhance your listening. For instance, high-quality speakers that can drastically improve the sound quality coming from flatscreen TV’s. These TV’s have great video quality but often have very poor sound quality. 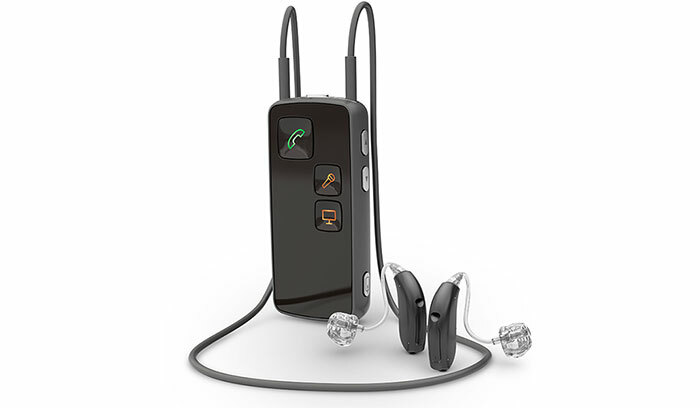 Audioengine 2+ (A2+) speakers make great hearing aid accessories. The Audioengine 2+ is a great introduction to high-quality audio and the perfect upgrade for your televisions wimpy built in speakers. You can expect better clarity and overall sound enjoyment when watching your favorite program. The Audioengine speakers utilize the same custom tweeters as the larger Audioengine 5+, matched with newly designed compact Kevlar woofers. Additionally, they use high-performance amplifiers with gold-plated speaker connectors. To say that the bass on the Audioengine 2+ is substantial for their size may be an understatement, but you should be the judge. The bass was coaxed from the A2 with some very clever acoustic and electrical design and without using any DSP or fake bass boost circuits. Wood remains a preferred speaker enclosure material for its stiffness at higher volume levels and the sealed cabinet focuses just the right amount of low end from the tuned front port slots. All this great engineering is wrapped in wood cabinets with a hand-polished finish to create a premium quality compact speaker system that puts all those built in TV speakers to shame! Your TV must have an analog output for these to work. Some of the newest models do not. Please make sure your TV has an analog output before ordering. There is a work around for the newer TV’s by using a DAC. Please contact us for more information. Affordable Audio – The goal of Audioengine is to provide a high-end listening experience at affordable prices with easy to use, high-quality products. The Audioengine 5+ powered speaker system was Audioengine’s flagship model and has become a best seller. The new A5+ has the same award-winning signature sound as the original A5 but includes customer-requested upgrades and features. Versatile – With custom Kevlar woofers, silk dome tweeters, and hand-built cabinets, the Audioengine 5+ includes a remote control, dual audio inputs and enhanced thermal management. You can charge your iDevice via the USB power port and also add a subwoofer to the variable output. Connect Audioengine 5+ to your computer’s headphone jack or pair with a USB DAC to achieve an even higher level of sound quality. The Audioengine 5+ works with any computer and there’s no software to install or settings to change. Easy Setup – Built-in power amplifiers save space and eliminate the need to connect Audioengine 5+ to a stereo receiver or external power amp. Simply plug the left speaker into an AC outlet and connect the included speaker wire from the left to right speaker. All internal components of the A5+ are tuned together, providing a more efficient system requiring less power than passive speakers and amplifiers. With superior stereo separation and incredible imaging, A5+ has a clear sonic advantage.